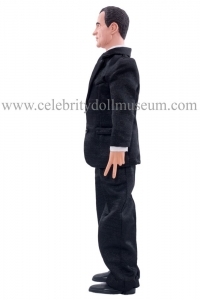 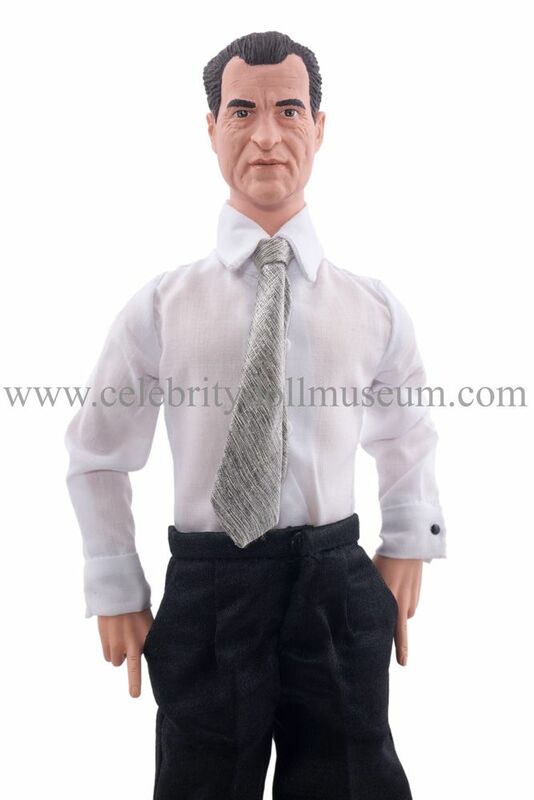 The Richard M. Nixon celebrity doll depicts him as the 37th President of the United States. 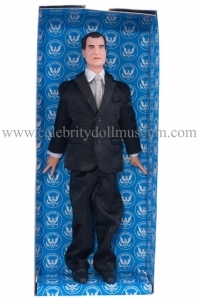 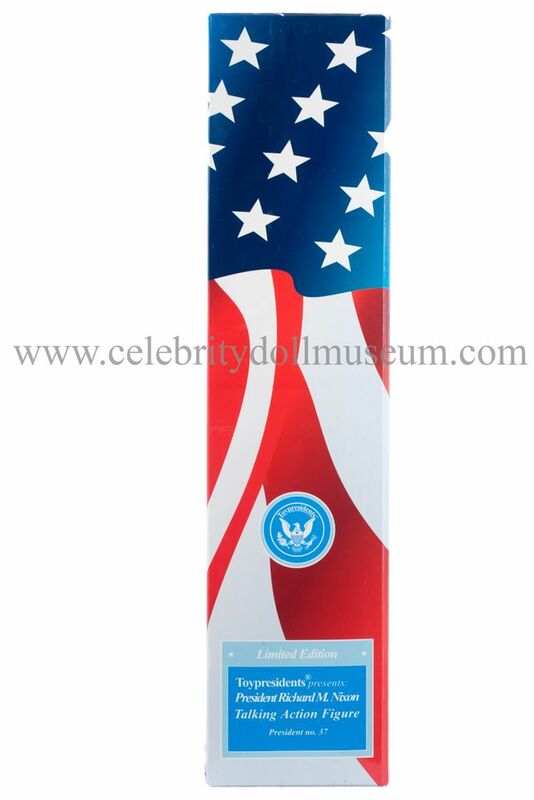 The doll was manufactured by Toypresidents, Inc. in 2003 as part of their Commemorative Edition. 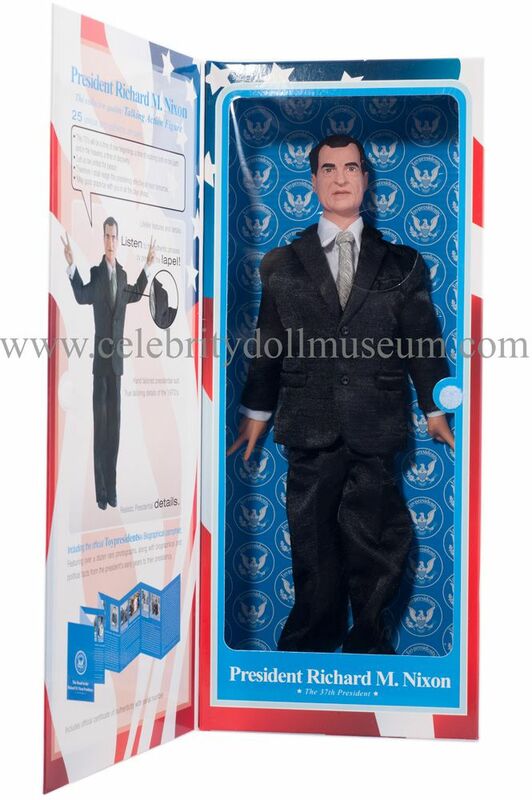 It is a talking doll that has Richard Nixon’s voice saying 25 unique and authentic phrases like “Therefore I shall resign the presidency effective at noon tomorrow” by pushing on the lapel of the charcoal grey tailored 1970’s Presidential suit. 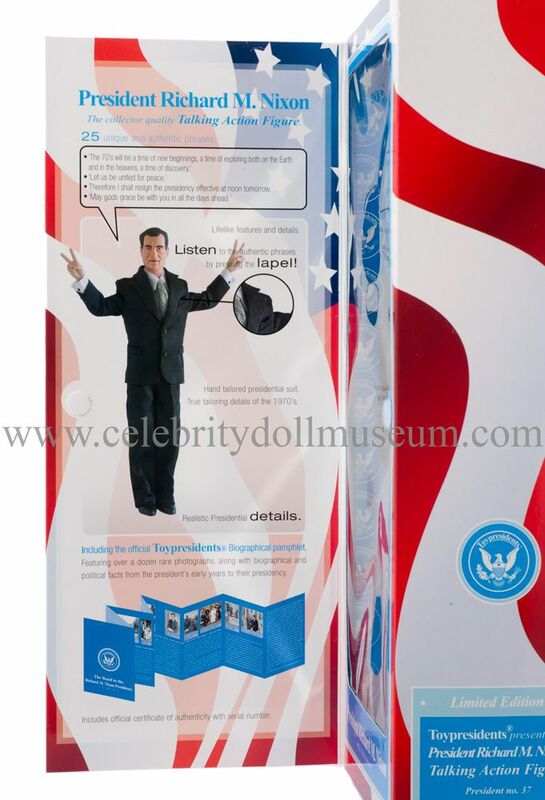 It also contains an official Toypresidents biographical pamphlet on President Nixon and a black adjustable doll stand in the box insert. 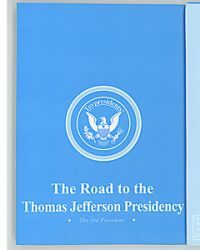 The 3 button batteries (LR44/L1154) are changeable. 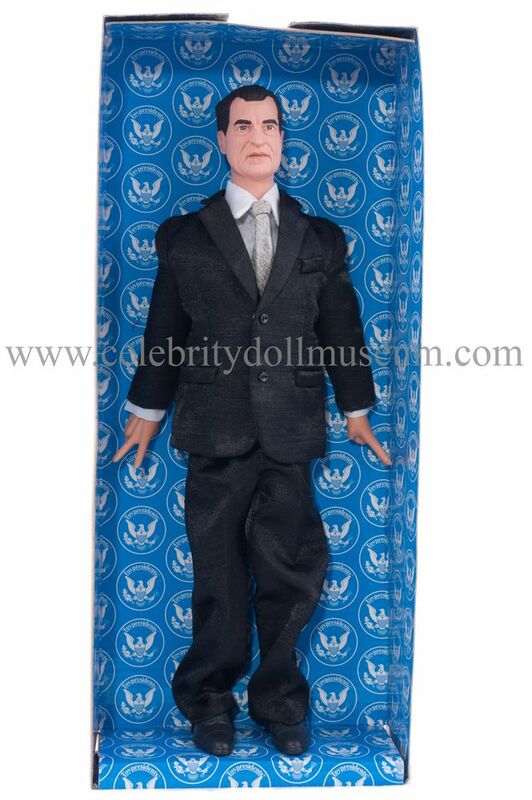 The clothing is above average on this Toypresidents doll with hand tailoring details that are true to the 1970s time period like slightly belled pants and a shimmery finish. Extras like tiny buttons and snaps sewn on, removable clothes, elastic stirrups keep pants down and shirt tucked in make it both a collectors’ doll and a educational doll for playing. 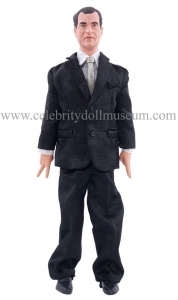 The doll wears a charcoal grey suit with tiny black buttons on sleeve and front, closure by snaps. Matching grey pants with snap in front fly and no belt complete the outfit. 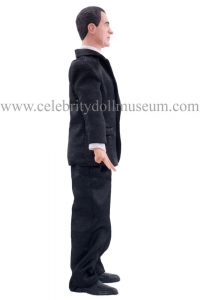 Under the coat there is a white cotton collared shirt, a light grey and white striped tie, , and tiny decorative black cuff link buttons and closure by snap Black plastic dress shoes and black knit socks finish off the feet. 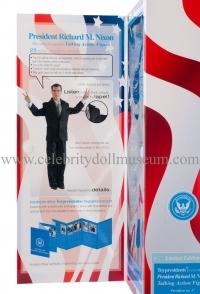 The doll’s underwear are blue cotton boxers which according to the informational booklet was Nixon’s favorite color. 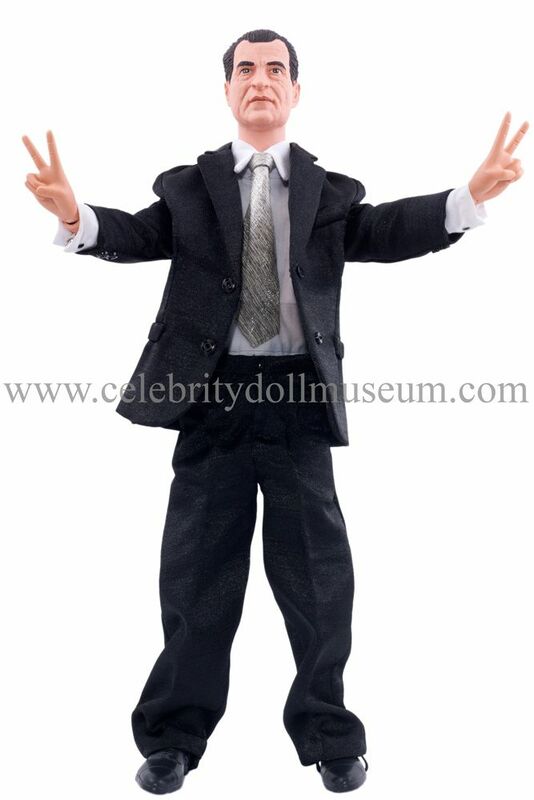 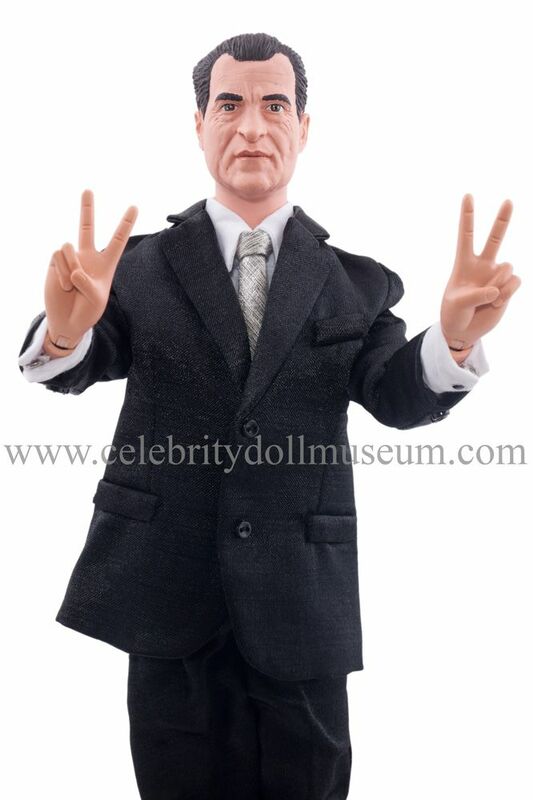 The dolls body has black molded hair and the hands are in the signature Nixon peace sign pose. 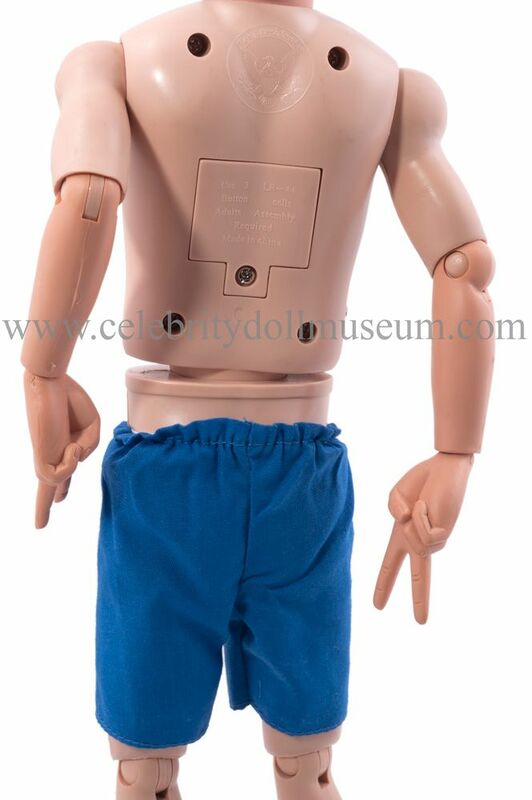 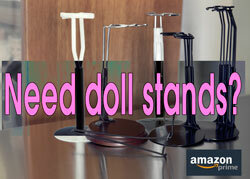 The doll is fully articulated at the major joints including wrists and ankles and very easy to pose. Above the battery compartment the Toypresident’s seal is stamped into the back of the torso.